In New Zealand and Australia, cat owners are obliged to microchip their cats and keep tabs on their whereabouts. But Britain is leading the way in cat containment solutions. British company, ProtectaPet, have patented technologies which contain even the most agile breeds of cats like bengals and orientals. Their products enable cats to come and go from their house and garden freely, enjoying the optimal quality of life, while owners have peace of mind and assurance of their safety. The enclosure is modular so it can be constructed to the client’s individual requirements, allowing for the addition of single or double gates, brackets or a mesh roof. It features patented CruciLock™ ground spikes with self-locking push fit design which provides a secure base on soft ground such as turf. Alternatively, the client can choose CruciLock™ bolt down plates for hard ground such as patios. 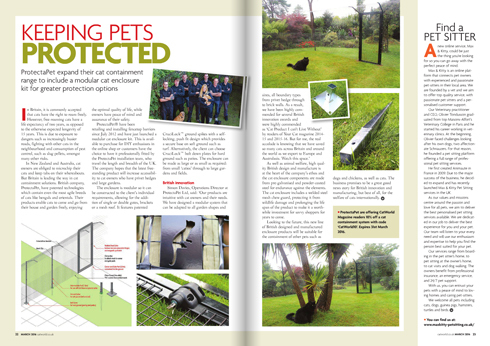 The enclosure can be made as large or as small as required: from small ‘catios’ through to large gardens and fields.